“Most people think a cemetery is two people with shovels, people digging holes and putting caskets in the ground but that’s really not all a cemetery is—there is a lot happening behind the scenes,” said Peter A. Blacksberg, president of Riverside Cemetery. We at Revelation Software would like to thank everyone who has been contributing to the Beta Testing Program. Your diligent testing, issue reporting, suggestions and insights have made OpenInsight 10 a product we can all be proud of. Documentation for OpenInsight 10 can be found HERE. The official release date for OpenInsight 10 is April 16, 2018. To resolve this issue, AREV32, CTO, and OpenInsight routines have been updated to first resolve the field name(s) to their "acceptable", OpenInsight names before attempting to process them further. Works members can download this patch from the Works Downloads section of the web site. OpenInsight for Web (O4W) is a flexible and powerful web development toolkit for OpenInsight. Don’t limit your application to the desktop! OpenInsight for Web (O4W) is a rapid application development tool that lets you generate responsive forms, reports, and dashboards. Use our GUI drag-and-drop to lay out your forms and then test in both desktop and mobile browser mode. You can also use our full-function API to create the most sophisticated web pages. 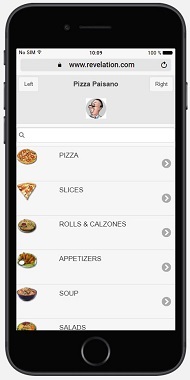 Using our WYSIWYG Form Designer we have created a sample Mobile Pizza Order Entry application. Click HERE to run the application.